The CLEVER Shower Double Dispenser offers a fresh new look with modern flair. Easily and singlehandedly, dispense shower liquids at the press of a lever. Neatly hang razors or shower loofahs from the accessory hooks. For complete organization, mount the CLEVER Shower Dispenser alongside the CLEVER Flip Shower Shelf and conquer clutter for good. The Classic Triple Dispenser in White restores order to your showering space. 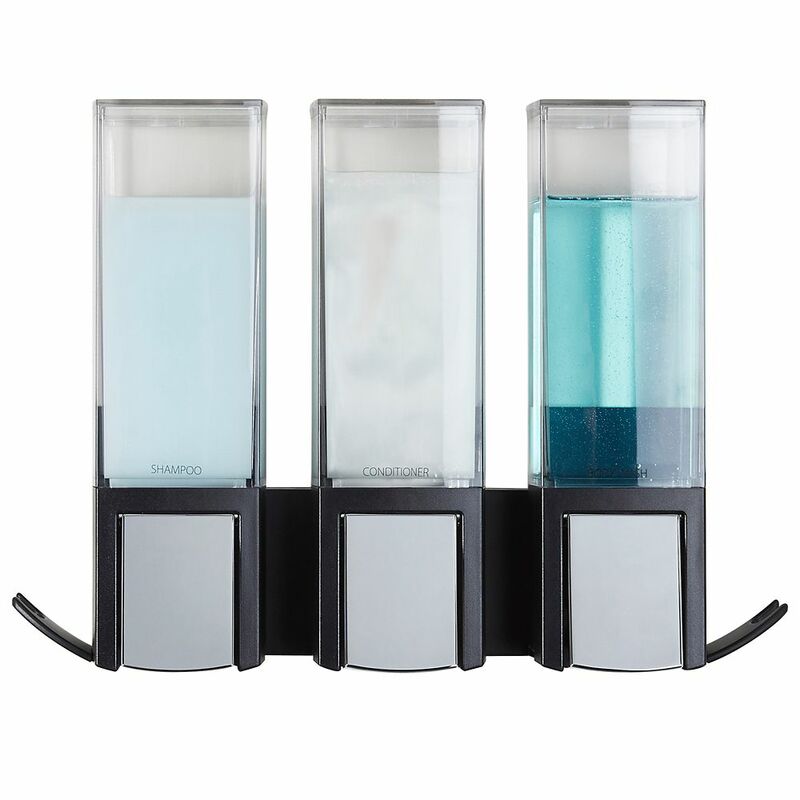 Equipped with three chambers to dispense shampoo, body wash, conditioner and other liquid cleansers in measured amounts, this unit eliminates waste and spillage often associated with poorly designed and cumbersome bottles. It does not require any drilling of your shower walls and installs easily with the included adhesive strips and silicone glue. Each chamber holds 430mL and can be refilled easily by lifting the lid for hassle-free replenishment. Level indicator windows signify when supplies are running low. An attractive and convenient way to organize and "de-clutter" your shower area. Uniquely designed wall bracket allows for installing either in a corner or flat on the wall. Installs in minutes using waterproof silicone adhesive and 2-way tape (included). Clever Triple Dispenser Black The CLEVER Shower Double Dispenser offers a fresh new look with modern flair. Easily and singlehandedly, dispense shower liquids at the press of a lever. Neatly hang razors or shower loofahs from the accessory hooks. For complete organization, mount the CLEVER Shower Dispenser alongside the CLEVER Flip Shower Shelf and conquer clutter for good.